Well, um, that didn't take long. 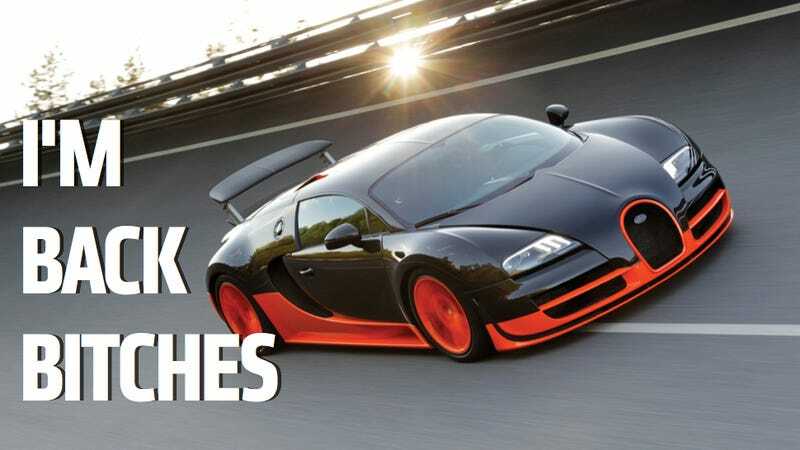 The people at Guinness World Records have decided to give the "world's fastest production car" title back to the Bugatti Veyron Super Sport today, less than a week after taking it away. It's quite an upset after we've been talking about speed records all week. You'll remember that the Veyron SS' record was taken away after Guinness decided that the car used to achieve the record 267.8 mph speed did not qualify as a "production car" because it had a deactivated speed limiter not present on the models sold to the public. With the limiter in place the Veyron SS can only hit (and I mean "only" very loosely there!) 258 mph. Emphasis mine. As I reported in my earlier story, the Guinness people were in the process of reviewing the Veyron's record and their definition of "production car." So while other carmakers may claim to build the fastest production car in the world, in the eyes of Guinness, it's officially the Veyron Super Sport and nothing else. That's not to say that the Hennessey Venom GT, Koenigsegg Agera R or some other car could attempt to change that at some point. We're certainly excited to see them try.